Most cottages and cabins are small, but that homey and cozy atmosphere that you feel once you step inside is often unlike any other. Perhaps it's the painted wood floors or the simple furnishings free of over-the-top embellishments that work such magic. Whatever the case may be, emulating that rustic feel in the bathroom is not as difficult as you might think. Wood fixtures are perfect additions to create that cabin ambiance that screams (or whispers) comfort and simplicity. For an authentic appearance, opt for wood paneling on the wall or the ceiling. 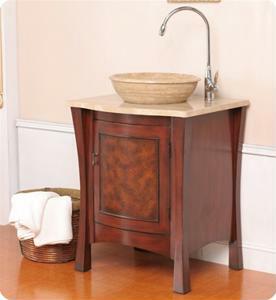 A rustic-looking bathroom vanity in wood can also create that cottage feel that you're looking for, but it's important to choose a piece with simple detailing as opposed to a Victorian-style vanity. If it seems as though all the wood in the bathroom is making the space smaller than it is, use whitewash to lighten the color. You can even paint over it with a soothing shade for that perfect rustic look. Additionally, ensure that you apply a sealant to the material to protect it from the shower and humidity.